Start the day by heading up to Shinyo-do Temple, up on Yoshida-yama. The main hall of this temple is surrounded by lovely cherry trees, and there are some more beauties outside the main gate. Bus Nos. 5, 100, 203 and 204 all stop nearby. The closest stop is the Jodoji stop. It’s a little tricky to find from there (use our map to find the way). Of course, all buses will be packed during this season, so a taxi direct from your hotel is a very good idea and will save time and effort. Walk east out of the temple’s main vermillion gate and continue straight for about 100 meters through a residential neighborhood and up a flight of steps to reach the top of Yoshida-yama (a small hill). Work your way north across the top of the hill (crossing a street en route). It will take some route finding, but you’ll eventually descend down to Imadegawa-dori Street. Walk east (away from the mountains) on Imadegawa for about 20 minutes, passing Kyoto University and crossing Higashioji-dori en route. 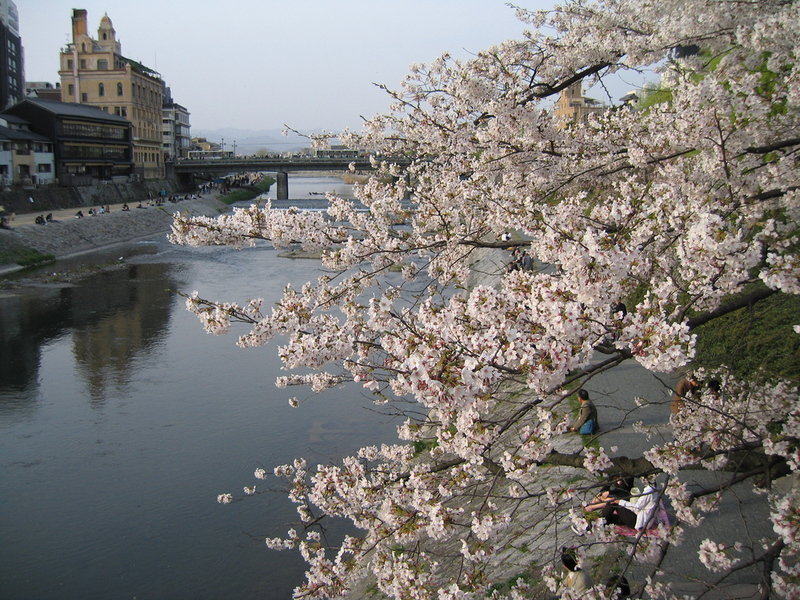 You’ll eventually find yourself at the confluence of the Kamo-gawa and Takano-gawa rivers. 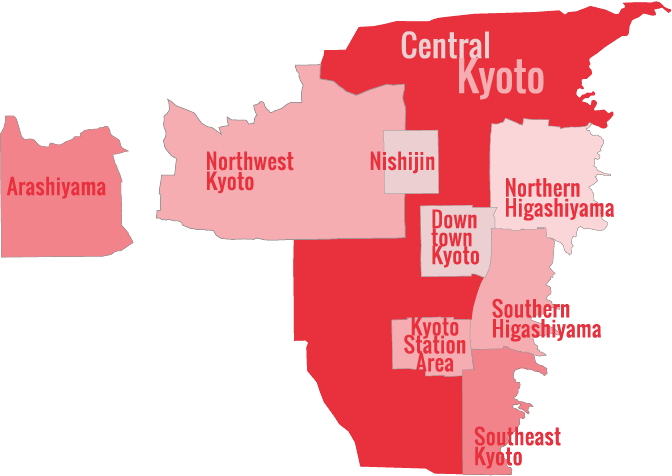 This is the area known as Demachiyanagi. 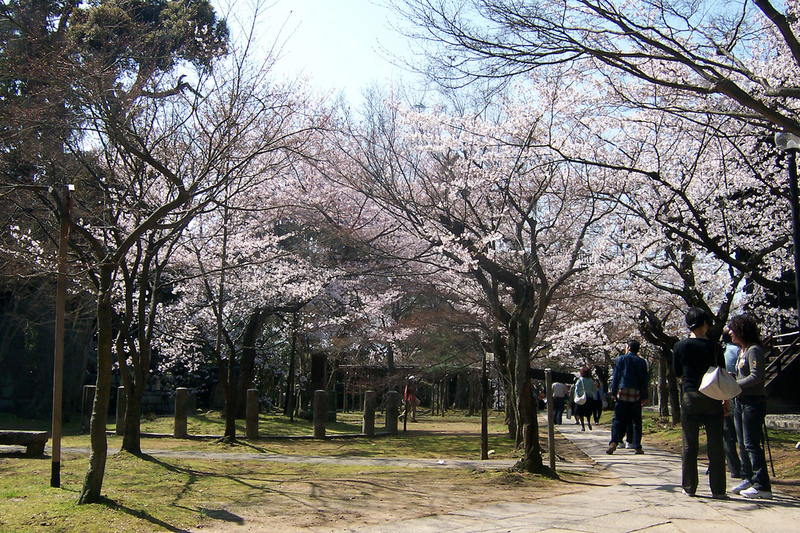 Grab some food in a nearby convenience store and have a picnic under one of the cherry trees that line the banks of both rivers. After lunch, take a taxi up to Daitoku-ji Temple (it should cost around Y1,200). Here, the subtemple of Obai-in is open for all of April. It’s one of the most beautiful little gardens in the city and there are some great cherry trees here. After checking out Obai-in, walk through the rest of the complex and check out any other gardens that are open. Leave Daitoku-ji and walk east on Kitaoji-dori to reach Kitaoji Bus Terminal, underneath which you can catch the Karasuma subway line back to central Kyoto. Take a well-deserved rest at your lodgings. Eat dinner downtown wherever you can find a seat. Walk south on Kiyamachi from Sanjo-dori. Kiyamiachi is one street west of the Kamo-gawa. 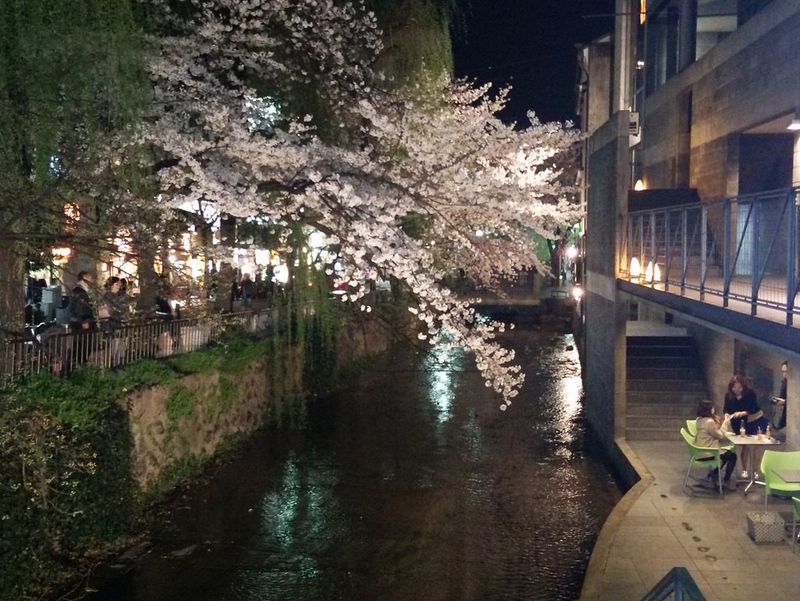 The canal that runs parallel to Kiyamachi is lined with cherry trees that are illuminated during cherry blossom season. It will be crowded until you reach Shijo-dori. Cross Shijo and continue along Kiyamachi. About 100 meters south of Shijo, the crowds thin out and you can enjoy this magical arcade of illuminated cherry trees with few people around to bother you.